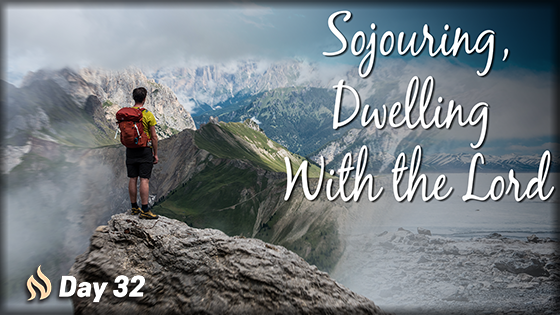 O LORD, who shall sojourn in Your tent? Who shall dwell on Your holy hill? He who walks blamelessly and does what is right and speaks truth in his heart; who does not slander with his tongue and does no evil to his neighbor, nor takes up a reproach against his friend; in whose eyes a vile person is despised, but who honors those who fear the LORD; who swears to his own hurt and does not change; who does not put out his money at interest and does not take a bribe against the innocent. He who does these things shall never be moved. Is life about the journey or the destination? This songful reflection encompasses both. Traveling with God down the wandering pathway. Dwelling with God in His exalted abode. The point? Who truly enjoys the benefit of living, now and forever, in relational companionship with God himself? Surprisingly, not the person who flawlessly fulfills exacting religious rituals. Rather, the person whose passionate habit is to live out integrity, such that others recognize and benefit from it. Derek Kidner (Psalm 1–72, p. 81) neatly summarizes the answer of the verses. James echoes the Psalm’s final promise. “Be doers of the word, not hearers only…a doer who acts will be blessed in his doing” (1:22, 25). Insecurity and instability plague the too-easily “moved” person; once here, then there. Shifting standards. Opportunistic allegiances. One posture today, another tomorrow. To exhibit God’s character fulfills. To experience God’s companionship unleashes genuine joy. Today, tomorrow, and for all the morrows to come. Draw near to God and He too will draw near with intent: to create new character within (cf. 2 Pet. 1:4).